Matthew: This is a real tale of two plots - one that works like gangbusters and one that... well, doesn't. On the plus side, I loved all of the action aboard ship. Showing Seska back on board, interacting with the Doctor, appearing to have the upper hand, really played well to the character's strengths and history. And having the Doctor and Suder working together in order to subvert the Kazon? Big fun. Really, the whole story should have been focused on the ship, with perhaps the whole rest of the crew on board the Talaxian vessels, trying to convince them to help, communicating clandestinely with the moles on board, etc. Unfortunately, we got the other side of this tale. Kevin: I agree that overall, the Voyager side of things was way more interesting. I think the only thing I didn't like was how incompetent the Kazon came off. They didn't think to do some basic work to make sure the ship was empty and at each stage almost seemed flummoxed by the technology. I think that's generally credible given Kazon history, but it really starts to undermine the idea that they could have taken the ship in the first place. I think this story could have been made more interesting by stretching it out. What it if it turns out that the Kazon don't have the resources or knowhow to actually keep the ship? What if it just made the Kazon on the Voyager the new target of the entire sector. Had they just ended up abandoning the ship because they couldn't hold it or it wasn't worth it to hold it could have been a fun twist. Matthew: The planet plot was boring and stale. We've already seen the story of Starfleet crew interacting with proto-humans, with Chakotay as the principal character, no less. Yawn. The primitives are also aggressive dumbasses who are no fun to watch. And we get yet another alien language that sounds ridiculous. We get the unceremonious redshirting of Hogan, to which Janeway responds "let's make this death the last one for a long time." Stirring! Of course, the CGI-monster snaps up another redshirt (unnamed this time) before the episode is done. But the real problem is that all of it is just marking time until they're rescued by someone else. Nothing the crew does really effects any change in their overall situation. Kevin: I agree again that the planetside plot was kind of a non-starter. Again, only time really would have made it interesting. Had they really had to dig in and make a life there for months rather than days, that could have been fun. Maybe another twist is that they actually end up making a go of it and have to make the same decision they faced in 37s. Do they continue a life here knowing they'll never get home? Or risk death again out there? The real problem that underlies both plots is that we know that the story will be resolved with Voyager back in Starfleet hands by the end of the episode, so before we get there, more interesting stuff needs to happen than marking time. Matthew: I really enjoyed seeing Suder again, and thought the story both advanced his character and provided nice resolution. The portrayal of psychological troubles was good, too, in that it wasn't gratuitous, it was a man trying to maintain control despite inner urges. I was disappointed that he dies, since that lowers the stakes for the show dealing with him, but I suppose they couldn't count on Dourif's availability long term. 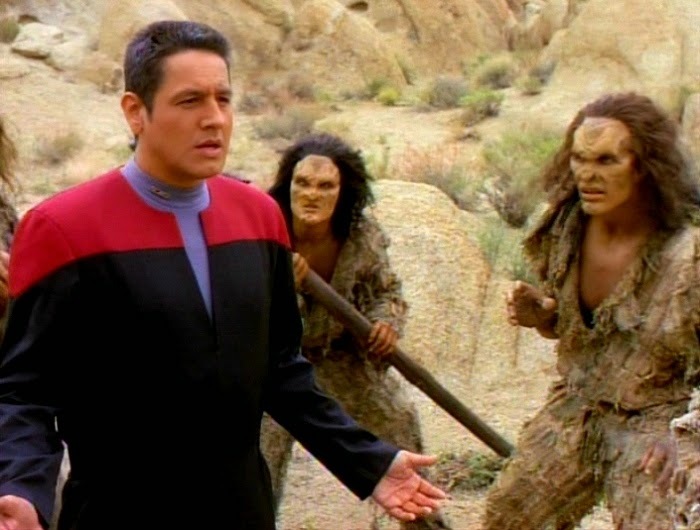 Speaking of lowered stakes, Chakotay being let off the hook for his "son" was lame (see the Memory Alpha link above for an extended analysis of the behind-the-scenes reasons why these decisions were made). Forgetting for the moment that the kid is his spitting image with a teeny tiny spoon on his forehead, it just effectively negates any potential interest in the story, which was nicely built in the prior part with Chakotay's father vision. The overall plot resolution was far too neat and quick, the ship was retaken (with no damage), Suder is dead, Seska is dead, all within 2 minutes. Kevin: I understand the dual problems of not wanting a baby on board (though there is already Naomi Wildman) from a production point of view, but Seska should have lived and remained prisoner on Voyager. She's just too interesting to have abandoned. The child could have added some fascinating layers and maybe an actual plot for the Chakotay character. The only real upside to this whole story is that we are done done with the Kazon, tidings so glad that even Tuvok would have to smile. One other thought I had is that it would have been fun to explore is Janeway having a real moment of doubt and regret about the last two years. Her decision to prevent the Kazon from gaining access to the Caretaker was admirable, but in the end, you could argue that Voyager's ongoing presence is as much a game-changing event, and now Voyager is in their hands. In a way, sending Voyager home and hoping a time-delayed explosion did the job to the array might have been a less disruptive event, and everyone they lost up to now would still be alive. I think Janeway would eventually reaffirm her decision, but it would have been a fun scene to watch, is all I'm saying. Matthew: Brad Dourif is terrific, and his character's death is a shame. Seeing as how you can effectively ignore him in solitary confinement for seasons at a time, it seems pointless and ill-advised to kill him. Anyway, he did a great job of communicating the intensity, pain, and borderline unhinged nature of the character. Kevin: Dourif definitely manages to pitch his struggle with intensity but it's never over the top. I really bought the struggle to save the ship, but not lost what he peace he had gained. Matthew: Martha Hackett was quite good for the most part, especially when she played against Robert Picardo. They had really crackling chemistry, and she really sunk her teeth into the lines. Picardo was great with Dourif, too, so he had a fine episode all around. All in all, no one was bad here. Kevin: Picardo really is the counterpart to Armin Shimerman on this show. He can really make the tiniest piece of dry humor really sing. His repartee with Seska was great. The rest of the crew wasn't particularly challenged, but certainly did a serviceable job. Matthew: Was the CGI monster impressive in 1996? I honestly can't remember. What I do know is that it doesn't hold up, now. I think this might have been one of those instances where not showing or half showing could be better than a full reveal (looking at you, George Lucas, in the Empire Strikes Back Special Edition...). Kevin: I think regardless of the level of technology available, you have to look at that result at any time and decide it's just not up to snuff. The classic horror non-reveal would have been better. I'm not even a fan of the monster as an idea that much any. Dissension among the crew, real deprivation, there are other more dramatically fruitful ways to threaten the crew. Matthew: The location shots, augmented by opticals, were pretty darned impressive here. The venerable Vazquez Rocks make their appearance, but lots of visually interesting alternate locations are shown, too. The optical and/or CGI landscape effects were much more successful than the monster, really putting the viewer there in the scene. Speaking of opticals, the space battles were excellent here (lack of lasting damage notwithstanding). Kevin: Yeah, I have no complaints. If nothing else, everything felt big, which was good. Had the landscape been mined better for the story, it would have been even better. Matthew: I was not a big fan of the alien makeup and costumes. Making the aliens look like moronic troglodytes didn't serve the story, and then dressing them in uniformly uninteresting rags sealed the deal. Kevin: It bothered me that the rags had visible seam lines. I know that's a tiny thing to be picky about, but that kind craft work would indicate a more sophisticated society. Where the hell are they even getting the cloth to weave? The people felt like placeholders, both plotwise and visually. Matthew: I'm going with a 3 here. There is a certain paint-by-numbers competence to the execution here. Everything that needed resolution got it. That said, many of the resolutions were along the path of least interestingness. Almost every scene on the ship was excellent, and almost every scene ont he planet was lame. The guest performances were excellent. So I think it all averages out. This is an OK show that could have been soooooo much better. Kevin: I agree with the three. You can't have a show that threatens huge consequences and then doesn't give you any beyond ushering off screen your least interesting plot elements from earlier seasons, and one or two you should have left the door open for. Leaving Seska alive and living in Suder's old quarters would have merited a four all on its own. As it stands, that is a total of 6 from us, and a solid if unspectacular start to the new season.